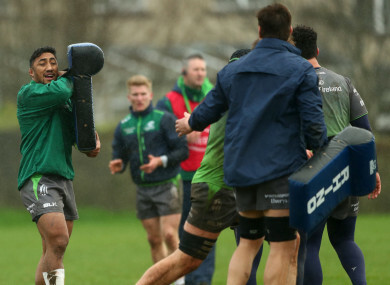 BUNDEE AKI CAN see a lot of similarities between this season and Connacht’s glorious march to silverware in 2016 as he prepares for his second Six Nations campaign. Three years ago Connacht’s great season was kick-started by a memorable trip to Siberia, a first win of the professional era in Thomond Park, the creation of their longest winning run and in the Six Nations win over Italy, five Connacht players featured for Ireland for the first time ever. This season Connacht have had a great two-match trip to South Africa, they won away to Ulster for the first time, won five in a row for the first time since 2015-16 and this week five players were included in Ireland’s Six Nations squad. Aki, of course, was not one of the famous five in 2016 — Kieran Marmion, Nathan White, Finlay Bealham, Ultan Dillane and Robbie Henshaw played against Italy — but he has been almost ever-present since he qualified for Ireland ahead of the November series in 2017. He started in all five games in the Six Nations last year and played every minute bar the final 24 against England, but despite following that up with victory in Australia and against his native New Zealand in November, he doesn’t see himself as a key player in Joe Schmidt’s side. “I am just a small cog in the wheel really. A lot of hard work has been done throughout the team. When one cog is not working then the whole team shuts down. “Throughout the whole of 2018, everyone worked on their own. Joe alluded to it, you are just a cog in the wheel, you have to make sure your cog is working and everything else will fall into place. The boys did that really well throughout 2018. “Hopefully we can kick that on in 2019,” said the 28-year old. He has been on Schmidt’s radar since Pat Lam brought him from the Chiefs in 2014 and Aki chalked up 12 appearances in Ireland’s most glorious year after making his debut against South Africa 14 months ago. The only games he has missed have been the November matches against Fiji and USA and the middle Test against Australia last summer, and knows he has come on the scene at a most glorious time for Irish rugby. “There were a lot of highlights in 2018, I would say New Zealand was one of the top ones, the Grand Slam was another one and winning on the Australian tour. I didn’t think Ireland had won in southern hemisphere for a long time. So there were a lot of highlights there but we need to keep our heads down and keep grounded, and keep tight as a group and keep working hard. “England is going to be a very tough one and I am sure that they are going to be looking to get one over on us again,” he said. Aki is thrilled to see Tom Farrell, Caolin Blade and Jack Carty join Ultan Dillane and himself in the Irish squad this week, with scrum-half Kieran Marmion also due back from injury next month, and he has no doubt they will deliver if given the opportunity. It’s been a superb season under new coach Andy Friend at the Sportsground and they are in contention in the PRO14 and European Challenge Cup as they head into the Six Nations. “The boys are enjoying rugby and footie. Our new coach Friendy came in and a few players have come in, but there is a lot of gelling going on and we are working hard as a group. But he will park those Connacht aspirations soon to concentrate on the Six Nations as Ireland embark on a year which will culminate at the World Cup in Japan with Aki very much part of the furniture. Email “Aki insists he's 'a cog in the wheel' as he aims to build on stellar first year of international rugby”. Feedback on “Aki insists he's 'a cog in the wheel' as he aims to build on stellar first year of international rugby”.